When Samsung launched its Galaxy S4 series smart phone with octa-core processor early this year, Indian mobile manufacturers were stunned by this technological advanced unit. We were still playing around with single core and dual core processors, and octa-core had literally disrupted the market. But not anymore; computer peripherals electronics company Intex has announced the launch of India’s first octacore smartphone which is at-par with any global brand in terms of processing power and speed. The smart phone is expected to be launched early next year with a price tag of approximately Rs 20,000. With an amazing speed of 1.7 GHz (Samsung Galaxy S4 is 1.6 GHz), this new smart phone from Intex will have 2 GB of RAM and would come in two versions: 16 GB and 32 GB. Having a thickness of only 7 mm, it will feature 6 inch HD IPS display and would be powered by Android 4.2 Jelly bean OS. And another interesting part: It will have 13 mega pixel rear camera along with 5 mega pixel front camera and will support dual sim. For this yet unnamed smart phone, Intex will use MediaTek’s ‘true’ octa-core processors which gives immensely powerful performance as all the 8 cores of the processor works simultaneously, unlike Samsung’s Exynos 5 octa-core processors, where only 4 sets of processors work at any given time. 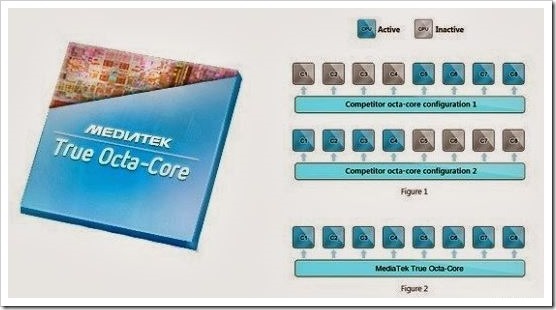 MediaTek’s ‘true’ octacore processors features 8 ARM Cortex A7 cores with Mali 450 GPU. Richer experience while playing Games: Games are one of the most important features which any smartphone user looks for while purchasing any handset. And with octacore, your game playing experience would be become incredible richer. The games would appear more realistic, faster and fun to play with. Ultra high resolution: With octacore processors powering this new Intex smartphone, users can experience ultra high resolution, which was not that efficient with dual core phones. Multi-tasking made easy: Any smartphone user will vouch the fact that opening too many apps and windows slow down the system and often it hangs in between. These issues would be a thing of past with octacore processors, as they power you with lot more processing power than ever imagined. Web browsing and chat applications will work like charm on octacore powered smartphones. We are sure that this just the beginning. Unconfirmed reports have started arriving that even Micromax is considering launching an octacore powered smartphone next year. This is certainly a big news for Indian mobile manufacturers, and it clearly projects one fact: Besides software and services, India is now transforming into an electronics manufacturing hub as well.